Kohli's dismissal triggered a controversy after Peter Handscomb took the catch at second slip off Pat Cummins' bowling . Pacer Jasprit Bumrah revealed that the Indian team was surprised by the on-field umpire's call on the controversial dismissal of skipper Virat Kohli on Day of the second Test against Australia at Perth on Sunday. 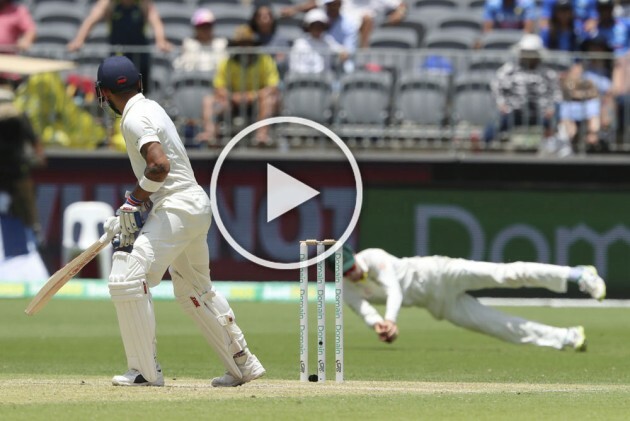 Kohli's dismissal triggered a controversy after Peter Handscomb took the catch at second slip off Pat Cummins' bowling and on-field umpires deferred to the third umpire with a soft signal of out, meaning only conclusive evidence could overturn the decision. However, TV replays were not sufficient enough to overturn the decision, which left the Indian fans and Kohli disappointed as the skipper walked off the ground without acknowledging the ovation for his superb innings of 123. "We were a little surprised by the on-field call but now that it's been done means it's been done. We will move forward with the game. That's about it," said Bumrah when asked about the controversial decision. Virat Kohli scored his 25th Test hundred to help India score 283 runs in their first innings. But the last six wickets fell for 60 runs which meant that they surrendered a 43-run lead. Talking about Kohli's knock, Bumrah said, "Obviously, we were in a bit of bother at the start (of the day), and then the way he played, the way he carried his whole innings was infectious. "He has been doing all the time and he is an inspiring leader. He leads from the front. So, it's a good thing for the team and hopefully he will keep doing it in future as well." The hosts finished day three on 132-4 and took an overall 175-run lead in the second Test. Bumrah said that they would want to restrict Australia to as few runs as possible on day four. "Tomorrow the first session will be important. We want to take early wickets, so it will restrict the total to as less as possible and that will help us to chase it in the fourth innings. In my eyes, our team is capable of chasing any total but we will try to minimise as much as possible," he said. "If you see the match, nobody has really gotten out (to balls that come) off the track. The crack is just there but it doesn't do a lot. It's only in the mind. So yeah, we will not take that into consideration (while batting)," he added. In the second innings, the Indian pacers really tested the Australian batting line-up, and didn't allow them to settle down with regular breakthroughs. Bumrah said the opening day was the best time to bat on this pitch, adding that he didn't worry about not taking too many wickets despite bowling splendidly in both innings so far. "According to me, the way I assess it, the first session of the first day was the best time to bat because we thought the wicket was green but it was not doing a lot. After that I think it hardened up because there was so much heat. "Then the bounce increased and the wicket fastened up. So this is what I felt at that time. "So, now, after we assessed the pitch in the first innings, we realized the length we had to bowl. We were much clearer in the second innings and from the start we wanted to hit that length," he said. Bumrah took just one wicket in Australia's second innings, despite bowling splendidly well and he said it is okay as long as his colleagues keep getting wickets. "Sometimes it happens that you don't get wickets off good balls but sometimes you get wickets bad balls. My mindset is everything gets deposited in the back and which can be cashed in one day," he said. "Basically, as a bowling unit we wanted to create pressure from both ends, so I was just trying to do that. Some days you get wickets, some days you don't but we wanted to create from both ends. "If I don't get the wicket, may be someone else would. That was the basic plan going into the innings – to create a lot of pressure. So, yeah, that was it," he signed off.